by GARY YAMASAKI The basics of the psychological plane of point of view were covered here and here, but this post will explore a lesser-known dynamic on this plane, and will use a scene from the 1993 thriller Jurassic Park to do it. As noted in the earlier posts, the psychological plane has to do with dynamics which provide for an audience an objective experience of a character–that is, being restricted to the external of the character–or a subjective experience–with the audience given access to the inner life of the character with “inside views” as the main means for accomplishing this. However, the scene from Jurassic Park demonstrates an alternative way by which a storyteller can provide a subjective experience of a character. At this point in the story line, a group of visitors to Jurassic Park–a “live dinosaur” theme park–are in two automated vehicles being given a tour of the park. At one point in the tour, the camera catches one of them, Dr. Grant, as he is looking out his window, with something catching his attention (47:32-47:37). The camera then cuts to a shot out the window at a clearing of tall grass, with a vehicle parked in the middle of the clearing next to. . .something, its precise nature impossible to determine from that far away (47:38-47:42); it will take a trek across the clearing for the visitors to discover it is actually an ill Triceratops lying on the ground. 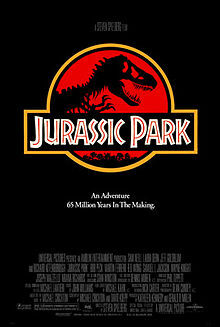 Of course, it was not necessary for the audience to have to wait for the visitors to make their way across the clearing before being informed the object was a Triceratops; director Stephen Spielberg could have simply cut to a close-up shot of the Triceratops to provide the audience with instant identification of what Dr. Grant couldn’t make out. But Spielberg chose instead to execute the featured narrative technique of this post. Literary critic Boris Uspensky illustrates this technique with a passage from Dostoevsky’s The Idiot in which one character, Rogozhin, attempts to murder another, Prince Myshkin: “Rogozhin’s eyes glittered and a frenzied smile contorted his face. He raised his right hand and something gleamed in it. The prince did not think of checking it.” Uspensky explains that this passage is “narrated through the perceptions of the prince (from his psychological point of view); accordingly, the knife is described as ‘something,’ as the prince himself perceived it at that moment. The object seems to be unknown to the author, whose point of view has completely merged at this moment with the prince’s. . . .” (A Poetics of Composition, p. 82). What Spielberg does with the view of the Triceratops from the jeep is essentially the cinematic equivalent of what Dostoevsky’s does with his treatment of the knife in Rogozhin’s hand. Spielberg also leaves obscure the nature of the object in the clearing, thus putting the audience in the same position as Dr. Grant of not being able to make out what it is. And in doing so, he leads the audience to view the scene through the psychological point of view of Grant. This is a narrative technique we also find in biblical narrative. Consider the conclusion to the account of Saul’s Damascus Road experience. The experience on the road leaves Saul blind, and he remains so until three days later when Ananias comes and lays hands upon him. The healing of his blindness is described as follows: “And immediately, something like scales fell from his eyes, and he regained his sight” (Acts 9:18). Here, the Lukan narrator does not specify the exact nature of what is falling from Saul’s eyes; this description is not from the point of view of the omniscient narrator who has full knowledge of all details of the account. Rather, the narrator uses language reflecting the perspective of someone who is not sure of what is falling from Saul’s eyes, which would be the point of view of Saul himself, or perhaps that of the others present (a “subjective” point of view), but not that of the narrator (an “objective” point of view).